The man who dominated round three of the 2013 MotoGP Championship two weeks ago at Jerez was in top form at the first of four free practices ahead of the Grand Prix of France at Le Mans. This rider, Repsol Honda’s Dani Pedrosa, took advantage of Friday’s dry conditions, and piloted his RC213V to a 1:34.645 around the legendary Le Mans Bugatti Grand Prix Circuit. This was no surprise, considering Pedrosa holds three records at Le Mans – Fastest Lap (1:32.647, 2008, Honda), Circuit Record (1:33.617, 2011, Honda), and Best Pole (1:32.647, 2008). Pedrosa has three wins at Le Mans in the former 250cc and 125cc classes, but never achieved a victory at Le Mans. His best results came in 2009 when he finished third. But this can’t be said for the two riders following Pedrosa in FP1. Yamaha Factory Racing’s Jorge Lorenzo and Valentino Rossi were second and third, respectively, and both YZR-M1 riders hold three wins each at Le Mans. Lorenzo, who used a new chassis at Le Mans, trailed Pedrosa by a mere 0.040 of a second. Rossi, who used an older chassis, was 0.293 of a second back. Taking the fourth and fifth positions were the Ducati Team duo of Nicky Hayden and Andrea Dovizioso, respectively. While with Ducati the past two years, Rossi finished on the podium at Le Mans both years. Hayden trailed Pedrosa by 0.327 of a second on the Ducati GP13, and Dovi 0.427 of a second. Just over a half-second behind Pedrosa was Monster Yamaha Tech 3’s Cal Crutchlow, who finished 0.021 of a second ahead of the current championship leader, Repsol Honda’s Marc Marquez. Marquez has ridden strong throughout the first three rounds, taking three podium finishes including his record-breaking win at Circuit of the Americas in Austin, Texas. After the win, Marquez became the youngest rider ever at 20-years old to win a premier-class GP. Rounding out the top 10 in the first free practice at Le Mans was GO&FUN Honda Gresini’s Alvaro Bautista, LCR Honda MotoGP’s Stefan Bradl and Avintia Blusens’ Hector Barbera, the leading CRT bike. Both Bautista and Barbera ran with new front springs. 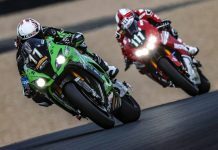 MotoGP reports that En route to 15th spot, Tech 3’s Bradley Smith escaped a trip through the gravel at Dunlop, whereas Michele Pirro – substituting for the recovering Ben Spies at Ignite Pramac Racing – coasted back to the pits with a technical problem. In 21st place, Karel Abraham was returning for Cardion AB Motoracing, having been hurt in a Texas crash and requiring seven screws and a plate in his right shoulder. With a 70-percent chance of rain in France’s forecast for Saturday, Friday’s first two free practice sessions are crucial for qualifying. If it rains, times will slow. And under MotoGP’s new regulations, the top 10 fastest riders from the first three free practice sessions automatically enter qualifying 2 on Saturday. The riders will return to the grid for Free Practice 2 later this afternoon.